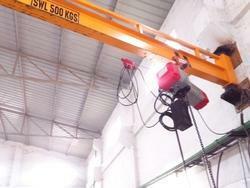 We have gained a remarkable position in the market that is involved in offering Chain Hoist Crane. Manufacturers of all types of cranes, wire rope hoists, electric chain hoists, crane kits. We manufacture and sell wire rope hosts from 5Tons to 50Tons SWL, and Electric Chain hoists from 250kg to 3.2Tons Lifting capacity of Carlstahl Craftsman make. 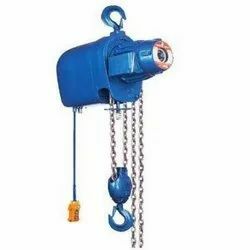 We have carved a niche amongst the most trusted names in this business, engaged in offering comprehensive range of Chain Hoist. Banking on our enriched industry experience, we are able to supply Carl Stahl Electric Chain Hoist. he performance range of the new DC-Com chain hoist is tailored to applications for normal requirements – just right for everyday use. And it also has all the features you expect from a high-quality Demag product. We are one of the renowned names of the industry engaged in offering a high quality range ofHoists to the esteemed customers. These products are designed as well as manufactured using high-grade raw material and components, sourced from the trusted vendors of the industry. Moreover, to meet different requirements of our clients, we provide these products in various specifications. We are top notch supplier of Demag Hoist. The performance range of the new DC-Com chain hoist is tailored to applications for normal requirements – just right for everyday use. And it also has all the features you expect from a high-quality Demag product. DC-Com units can be easily integrated into the Demag KBK crane construction kit rail system.